Gadgets – “If I can do it anyone can”. A quote – from the happy owner of a: Panasonic Bread Making Gadget. He took barely 2 minutes to assembly all his ingredients into his bread maker, before closing the lid and setting the programme which took another 60 seconds. Is making bread really that easy & uncomplicated, that even a 3 year old could do it? ‘It’s quicker than actually going to the shops to buy bread’. Yet another hilarious quote. all I could do was shake my head in astonished acknowledgement of the process itself. Whilst enjoying his humorous comments. We’ve all heard the news about how our processed foods contain way to much sugar & salt. This includes basic food staples, such as ‘our daily bread’. Even the average supermarket ‘own’ baked bread, is not exempt from this malay. In fact the mass produced bread we eat today is one of the worst offenders when it comes to sugar and salt content. In some studies a loaf of bread, was found to contain 10x the recommended daily sugar intake. Than an average adult would take in a whole day. 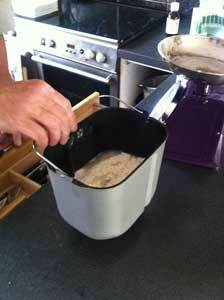 What better way to reclaim back our lives that with innovative new gadgets such as bread making gadget. Photo 3 The gadget is set to program. So what are these gadgets all about? Why should we invest our hard earned dollars on such a gadget? I can think of many reason. They are innovative – which is cool for those of us out there who love gadgets of all descriptions. You will be taking back control of your health with these handy gadgets literally – because you can control the sugar and salt content that goes into this very basic of food stapes as well as other food items. You can make not only all types of loaves. But listen to this. You can make jam, pizza based dough, brioche dough, bake cakes, and make compote. Not only that but you can do variations on the theme. Gluten free, speciality breads, seeded breads, raisin based, French style breads, Italian. The list goes on. Such gadgets are safe and easy to use. This particular gadget, had a step by step guide on how to use it. -So many of our gadgets have vague instruction that are incredibly annoying and or complicated. 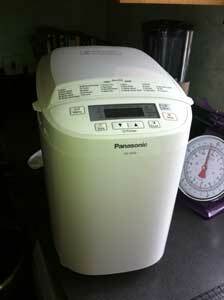 I can honestly say after watching the owner of this particular Panasonic Bread Making Gadget. That I am totally flabbergasted about how easy it is to use. So much so, that I’m rushing off to the shops to get my very own multifunction bread making gadget. The point I’m trying to make here is that. Not only did it cut out the whole process of mixing ingredients, kneading the dough with your bare hands, then proving the dough twice, before finally baking it in an oven. It is obvious that this traditional method V’s the Gadget method. Is not nearly as cost effective as the Panasonic Bread Making Gadget. And uses way much more fuel to cook. When I asked my friend why he decided to invest in his bread making gadget. He replied: “It’s easier for than going down to the shops to buy a loaf”, (which for him means a trip into town, where he will inevitably spend more than he bargained for), “as well as a lot less hassle”. I laughed out loud. I promise you nothing beats the smell of home made bread. Mixed with your own choice of ingredients. Our finish loaf contained no artificial ingredients, honey as opposed to sugar. & It tasted divine. All things considered, this is a ‘must have gadget’ for those of you feed up of being held to ransom by supermarket giants. These organisations have stealthily introduced, reduced packet sizes for less weight in food items. And think we the consumer will not notice. At the same time they will continue to increased the cost of many of our basic food staples. ( Need I say more). So the common sense way to get around this dilemma in recession hit US. is to ‘make your own’ with the help of a handy gadgets. 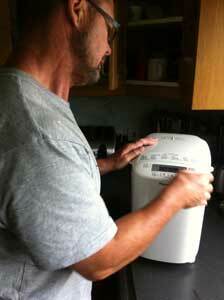 For approximately :$100 – $140 dollars you could invest in a handy life enriching simple gadget. like the: Panasonic Bread Making Gadget. This is the equivalent of buying 58 x 500g average size loaves, at $2.50 a pop. If the average family of four gets through 5 loves of bread a week. That only an the cost of 11.6 week supply of bread. Amazingly good value. Basically in 12 week of buying bread you will have paid for your bread making gadget. Not bad at all!! Not to be facetious. But if someone told me that by investing in cool new gadgets, such as the Bread Maker I could cut my bread bill $500 a year. I think I would beat Usain Bolt in a sprit down to my local electrical store. Still not convinced? then consider this . Your saving over the next 5 years, factoring in a conservative estimate on the life expectancy of your bread making gadget. Could be a minimum of approximately $2,600. On saving you time you just throw your ingredients into the bread maker, go to work, and return to a fresh loaf of bread. Now you begin to see how literally gadgets such as these can literally ENRICH YOUR LIFE.